This gentle, hydrating formula with powerful acne fighting natural extracts helps clear and treat acne without dryness or irritation, helping you manage excess oil and infusing skin with the healthy moisture that soothes, calms and restores red, acne - stressed skin. Fights blemishes at their source, helping treat, clear, and prevent future acne outbreaks. This lightweight, gentle yet effective, moisturizing base helps clarify, and leaves skin feeling fresh and hydrated. A fast-acting, clear skin treatment mask helps fight multiple forms of acne while preventing future breakouts. This mask is a power packed formula with maximum strength, to dry and clear acne blemishes and help prevent their return. 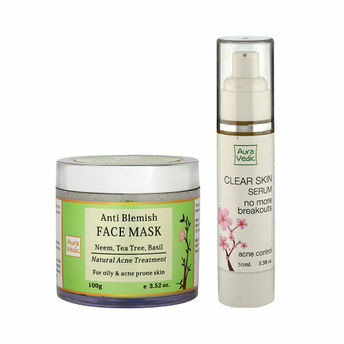 This Clear Skin Anti-Blemish mask is loaded with ingredients like Neem ,Tea tree and Basil on that help reduce the appearance of acne, blemishes and spots. It helps flush out environmental toxins, dirt, and debris that can clog pores and cause skin to look dull, leaving the complexion clarified, refreshed, and healthier looking. Neem keeps the skin pores oil and Sebum free, white clay absorbs environmental toxins, and Tea Tree dissolves impurities.